Papa John’s, the fourth largest US pizza chain restaurant, behind Domino’s, Pizza Hut and Little Caesar’s has partnered with 3rd party delivery service DoorDash. The partnership is expected to extend the reach of existing in-store direct delivery by leveraging a deeper reach into suburban and rural locations using the “dasher” network. Consumers who were currently outside of delivery zones will now have greater opportunity to get the pizza delivered to their home, business or off-premise location. With over 3,300 locations in the US, Papa John’s has continued to focus on quality ingredients, taste and flavor of their product. Sales at the pizza giant have been slipping and the brand is looking to rebound. Menu innovation has created some new appeal for customers and extending the delivery zones can provide greater ability for Papa John’s to steal share from other leading chain and independent pizza restaurants. Restaurant delivery in 2018 was estimated to be $45 billion, according to FoodserviceResults. 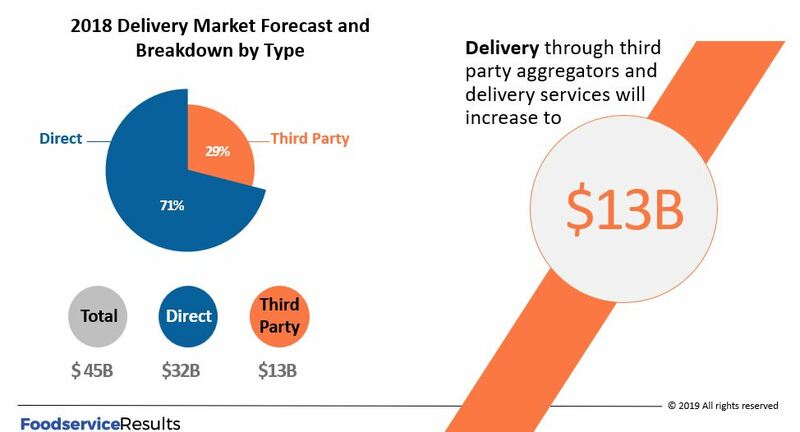 Direct in-store delivery represented $32 billion while the remaining $13 billion was through 3rd party delivery providers. While many Americans have used 3rd party delivery services, a large portion of consumers have not used a 3rd party aggregator or delivery service. According to the Off-premise Insights Report, 41% of consumers surveyed indicated they haven’t used these new digital services. Although many consumers live in remote locations, can’t afford the service or lack the sophistication or desire to use digital ordering, the trend is positive in the use of delivery services beyond traditional direct delivery from the store. 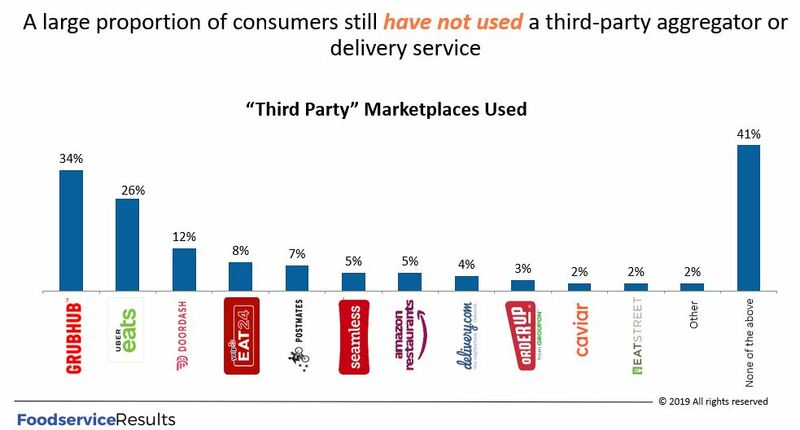 Among those surveyed, Grubhub, Uber Eats and DoorDash are among the most used 3rd party marketplaces. For many restaurants, 3rd party delivery takes control away from the restaurant operator. Once the food order is handed off to the delivery person, they have to put faith in the driver to get the order delivered quickly. Food has to arrive with the proper temperatures maintained so heating and cooling bags are often necessary. But most importantly, the driver should represent the brand which means good, friendly customer interaction, appropriate appearance and respect for the neighborhood safety while driving. When issues arise through 3rd party delivery, the restaurant operator typically gets the blame. As I see it, the convenience of 3rd party delivery providers will continue to see high growth at the expense of traditional take-out and dine-in restaurant occasions. Consumer continue to value their time and prefer the quality of restaurant meals compared to cooking at home. American culture has changed with the continued improvement and affordability of new technology. Binge watching Netflix or Hulu using enormous high-definition televisions and the ease of mobile device ordering has become a common behavior for many consumers, especially Millennials and GenZ age groups. Delivery is expected to continue to grow at double digit rates while in-store dining occasions will remain flat over the next 5 years. Expect to see more restaurant brands leveraging 3rd party delivery partners and more Americans jumping on board to dash their way to better income. Chipotle Mexican Grill continues to invest in digital sales and a national points-based loyalty program designed to encourage greater frequency and connection between the brand and their customers. Recently teaming up with Venmo, the digital wallet company and depositing surprise dollar amounts ranging from $1-$500 in fan accounts through March 15. Chipotle hopes to create engagement with consumers to strengthen the connection and build new connections with lapsed or non-customers. It’s expected that 25,000 fans per day will receive the rewards. What’s in it for the consumer? Rewards translate into free stuff. 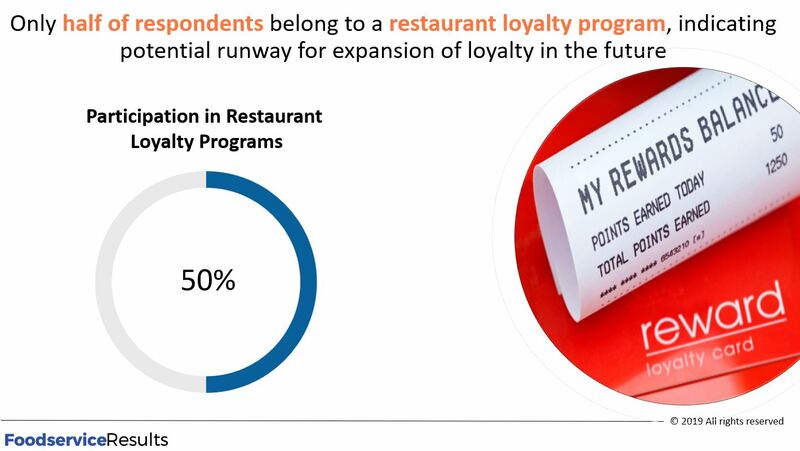 According to FoodserviceResults recent Off-premise Insights Report, only 50 percent of consumers participate in restaurant loyalty programs. 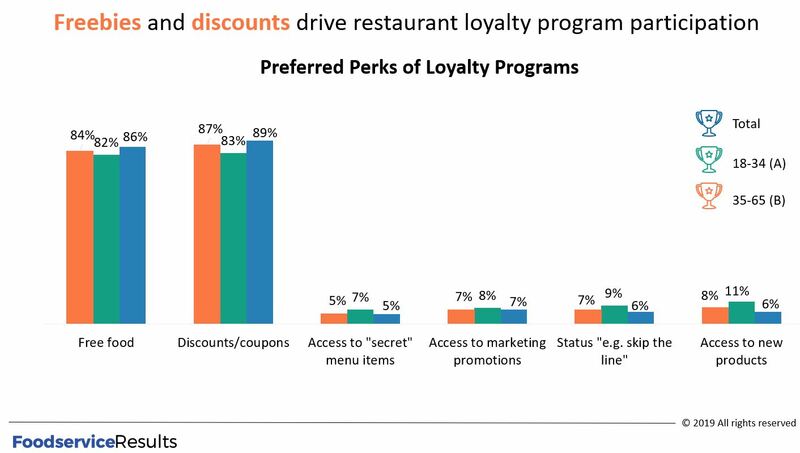 Building loyalty program participation allows restaurant brands to digitally market to their customer base, reminding them to consider their restaurant. Marketing is often focused at specific times during the day when consumers are hungry and are looking for a place to eat. 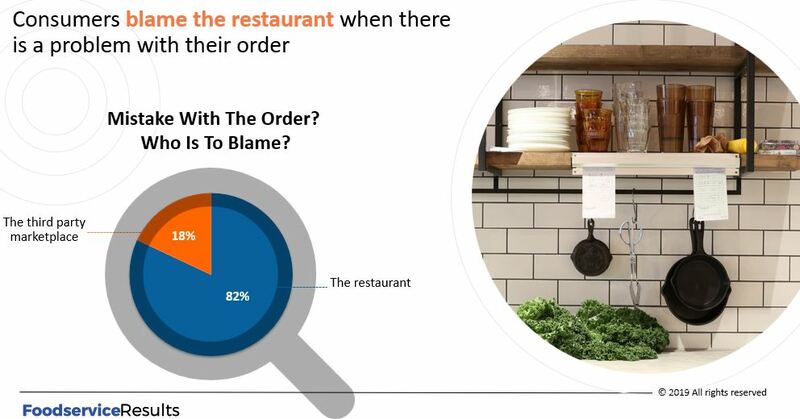 In fact, the Off-premise Insights Report’s consumer survey identified 68 percent of consumers decision to dine-out are based on impulse and not planned. Consumer dining behavior can be very spontaneous and often is based on top of mind thought. These decisions are impacted by social media images, billboards, radio and television advertising. The ability to market directly to a consumer’s mobile device or computer can be a very powerful tool. What do consumers look for in loyalty rewards? Some reward programs offer features and benefits like access to secret menu items, exclusive marketing promotions, skip the line benefits and access to new products. Although younger consumers appreciate these perks, only 5 to 11 percent of consumers indicated that these benefits drive loyalty participation according to the report. Preferred perks included free food, discounts and coupons driving participation with 82 to 89 percent of consumers surveyed (based on a survey of 1,500 consumers). Freebies continue to be the relevant driver for consumer loyalty. Restaurant brands like Chipotle have much to gain by rewarding their customers with incentives. First, this engagement forces customers to sign up with the brand, providing information and access to the consumer. The data can be mined for consumer intelligence in how, when and where consumers use the restaurants. Access can build marketing touch points which drive impulse decisions and keep the brand top of mind and relevant to customers. Second, rewards build traffic and frequency to Chipotle restaurants. As creatures of habit, US Consumers often get accustom to certain behavior which can be repeated. These occasions can include work lunch, social meetings with friends, dinner with family or significant others. This investment builds sales, often with volumes above the reward amount resulting in sales growth. Lastly, brand direct perk programs encourage consumers to purchase directly from the brand through their mobile app. Costly third-party delivery programs don’t always provide the perks, driving more consumers to order directly from the restaurant. Direct purchase can be more profitable for restaurants as they don’t have the typical 30 percent surcharge. As I see it, restaurants will continue to invest in digital strategy and perks programs that are simple and easy to use. Relationships with younger consumers who actively use Venmo and other applications or mobile wallets can allow smooth access to rewards. Today, 50 percent of consumers use restaurant loyalty programs and engagement and participation continues to increase. Investments in programs will continue to benefit customer usage as rewards continue to move from nice to have to must have for many consumers.